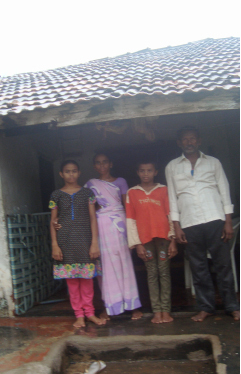 This family has now been sponsored. Thank you so much. As you can read from the brief bio below, Martha and Raju were in great need. We have many more families in need of help, please check out our ‘families in need’ page for other families awaiting for help. Martha and Raju Kaparapu have faced adversity and still have hope. Imagine having your home destroyed in monsoons and having to move to a rental house with no electricity or running water and living conditions so dangerous for adolescent girls that they have had to send them away. This is the plight of Martha and Raju. Raj can no longer work and Martha can only do odd jobs. Their sponsorship means that they can work towards a small shop or grocery stand which can lead to safer living conditions for the family. ← Family of the Month – The Arakal Family – Sponsored!